DES MOINES, Iowa — Drake University played host to the second Democratic Presidential Debate on Saturday, Nov. 14 where the three candidates, Vermont Sen. Bernie Sanders, former Secretary of State Hillary Clinton and former Maryland Gov. Martin O’Malley faced off in attempt to separate themselves from each other. With immediate reports naming O’Malley as the winner, newer reports show more confusion as to which performed the best. The Washington Post reports that O’Malley was the winner simply because of the notoriety he began experiencing during the debate from viewers searching his name. On the other hand, CNN’s Julian Zelizer believes that the debate was still mainly between Clinton and Sanders and O’Malley simply couldn’t get enough traction to pull ahead of the two leaders. While the general consensus as to the winner is unclear, one thing was certain: The recent attacks in Paris played a major part in the debate, including the cancellation of all the pre-debate coverage and the slot being filled with more analysis of the terrorist situation with the United States’ longest ally. All three candidates had watch parties in the Des Moines area. Clinton’s party was at the Olmsted Center on Drake University’s campus. She also made an appearance after the debate to address her fans. Sanders’ watch-party was held at Varsity Theatre, which is just off the east side of Drake’s campus. O’Malley’s watch party took place in a different type of location: Saints Pub and Patio, which is located on the north of the Drake campus. There were five main points that the moderators (John Dickerson — CBS News, Nancy Cordes — CBS News correspondent, Kevin Cooney — KCCI-TV and Kathie Obradovich — Des Moines Register) brought up with the candidates. The issues were ISIS and foreign policy plans in response to the Paris terror attacks, college tuition and gun control. Each candidate received one minute at the beginning of the debate to introduce themselves and express their responses to the terrorist attacks in Paris that left at least 129 dead and 352 injured with 99 in critical condition. Sanders was the first to respond. “Together, leading the world, this country will rid our planet of this barbarous organization called ISIS,” Sanders said. Sanders was later asked if his previous stance on the number one national security threat to the United States had changed, and his response was that it had not and that climate change is directly related to terrorism. “I would argue that the disastrous invasion of Iraq, something that I strongly opposed, has unraveled the region completely and lead to the rise of Al Qaeda and to ISIS,” Sanders said. Sanders also made a comment about the current situations facing the Middle East. “We have to understand that the Muslim nation in the region, Saudi Arabia, Iran, Turkey, Jordan, all of these nations, they’re going to just have to get their hands dirty and their boots in the ground,” he said. O’Malley responded to Sanders’ comment by telling a story of a woman he met earlier in the campaign. The former governor also made it clear he believes that the way to achieve peace is not by hating a specific group of people. O’Malley also said that the United States needs to have a reaction to the Paris attacks. Clinton took a strong stance regarding the issues with ISIS and terrorism. “We need to have a resolve that will bring the world together to root out the kind of radical jihadist ideology that motivates organizations like ISIS, the barbaric, ruthless, violent, jihadist terrorist group,” Clinton said. The former Secretary of State also believes that ISIS is the leading threat as an international terror network, but that military force should not be used unless all other resources have been exhausted. Clinton, who wishes to make community college free and public college debt-free, discussed her plan for the payment of the expenses. “I will pay for it by, yes, taxing the wealthy more, closing the corporate loopholes, deductions and other kinds of favorable treatment and I can do it without raising the debt, without raising taxes on the middle class and making it reasonably manageable within our budget so that we can be fiscally responsible at the same time,”Clinton said. O’Malley, with a similar view, wants to also make public college debt-free but also freeze tuition. In Maryland, O’Malley made these changes by raising the sales tax, gas tax and the taxes on families making over $150,000 a year. “We did, in fact, raise the sales tax by a penny, and we made our public schools the best schools in America for five years in a row with that investment,” O’Malley said. “Yes, we did ask everyone in the top 14 percent of earners in our state to pay more in their income tax, and we were the only state to go four years in a row without a penny’s increase to college tuition. O’Malley went on to say that the reason Maryland was so successful in this endeavor is because of the realization that the wealthiest people in the country should not receive special treatment and that they should instead be investing in the state’s resources and young people. Sanders, with a more radical view, has a plan to make public college completely free. He believes he can do this by raising the taxes for the top earners to pay more. Sanders said that he would not go over 90 percent taxation. Clinton began the discussion of gun control by contrasting the differences in her views from Sanders. Clinton went on to give statistics reflecting gun-related crimes. Sanders, defending himself, said that he even though he voted in favor of the immunity law he still wants there to be stricter rule when it comes to the distribution of weaponry. Sanders also called for “radical changes in mental health in America” to protect people who are suicidal and homicidal from purchasing firearms and instead encourage them to receive much needed help. O’Malley, who is very open about being against the National Rifle Association (NRA), was quick to make his stance on gun control known. O’Malley also then called for the repeal of the immunity law for gun makers and sellers. He, like Clinton, accused the law of causing more harm. He also named instances of Clinton’s change in status on gun safety laws. 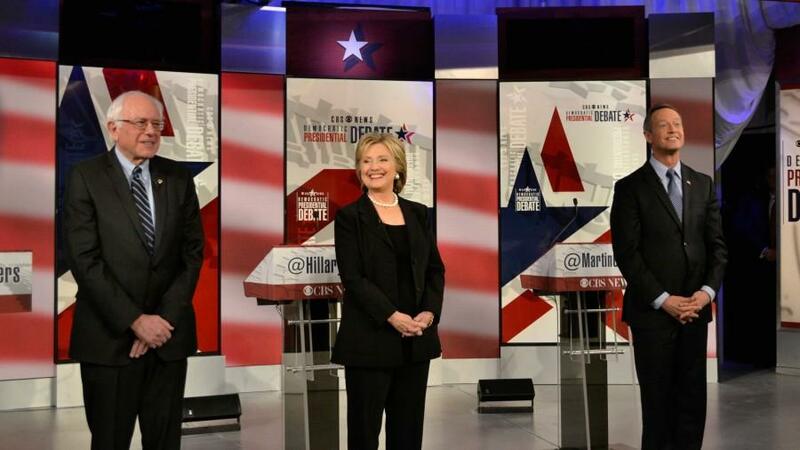 The next Democratic debate will be held on Saturday, Dec. 19 in Manchester, New Hampshire.